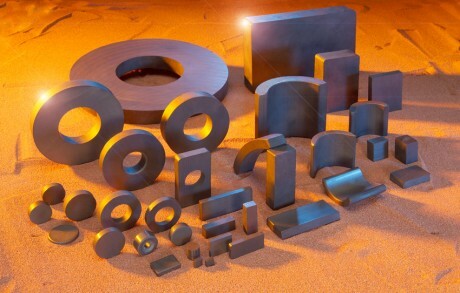 Ferrite Magnets or ceramic magnets are the most used magnets, with a maximum energy product from 1 to approx. 4.3 MGOe. Ferrite is the cheapest magnet material and has a high corrosion resistance, due to which a coating is not necessary. Ferrite magnets can be produced both isotropic and anisotropic and the usage temperature is a maximum of 225˚C. The applications are very broad; think about products such as megaphones, magnetron, measuring equipment, toys, motors, reed-contacts etc. Pressed out of a mixture that is approx. 80% iron oxide and 20% barium oxide or strontium oxide. Easily obtained raw material, therefore inexpensive. Temperature range: -40 °C to +225 °C. Isotropic ferrite material can be magnetized in multiple directions. Isotropic ferrite material can be supplied that is compliant with the EN71 standard. Also available in plastic bonded version.